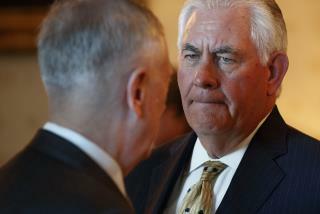 (Newser) – Secretary of State Rex Tillerson finds dealing with the White House frustrating, and tensions boiled over Friday when he "exploded" at a White House aide, insiders tell Politico. The sources say White House officials present, including Jared Kushner, were "stunned" when Tillerson laid into presidential personnel office chief Johnny DeStefano for rejecting his picks for State Department posts. Tillerson also accused the White House of leaking damaging information about him to the media, the sources say. DeStefano's office has turned down many of Tillerson's choices for top posts either for being Democrats or for being Republicans who criticized Trump during the campaign, aides say. It is hard to see this story as overblown when Sec, Tillerson still does not have any under-secretaries and most of our Ambassadors have not been appointed after the Minority President demanded the former ambassadors immediate resignations. The minority president doesn't respect anyone whose judgment is demobnstrably better than his. Resign Mr. Tillerson. You do not need to be there. Don't enable this administration. I hate gossiping. Done as a smear.